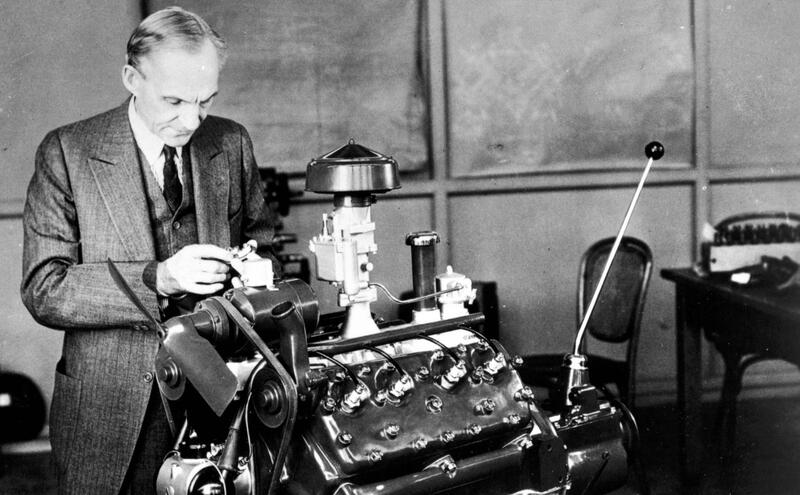 Mini Bio: Henry Ford (July 30, 1863 – April 7, 1947) was an American industrialist, the founder of the Ford Motor Company, and the sponsor of the development of the assembly linetechnique of mass production. Although Ford did not invent the automobile or the assembly line, he developed and manufactured the first automobile that many middle class Americans could afford. In doing so, Ford converted the automobile from an expensive curiosity into a practical conveyance that would profoundly impact the landscape of the twentieth century. His introduction of theModel T automobile revolutionized transportation and American industry. As the owner of the Ford Motor Company, he became one of the richest and best-known people in the world. He is credited with “Fordism“: mass production of inexpensive goods coupled with high wages for workers. Ford had a global vision, with consumerism as the key to peace. His intense commitment to systematically lowering costs resulted in many technical and business innovations, including a franchise system that put dealerships throughout most of North America and in major cities on six continents. Ford left most of his vast wealth to the Ford Foundation and arranged for his family to control the company permanently.